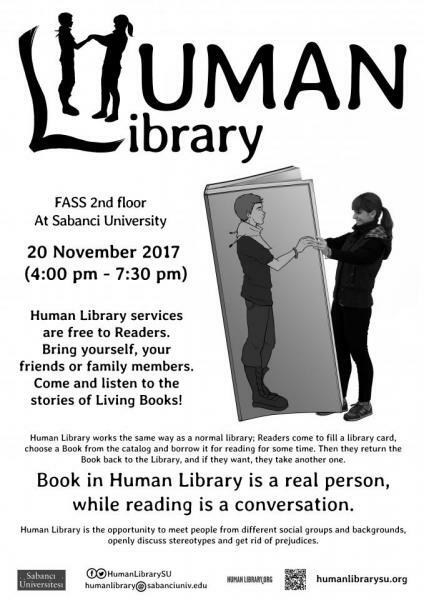 We invite you to Human Library which will be held at FASS 2nd Floor on 20th of November between 16.00 – 19.30. Human Library is an international non-profit project dedicated to the diversity in our society, organized by volunteers. Human Library’s mission is to build a constructive dialogue between people from different social groups. Such a dialogue in an informal and safe environment helps to get rid of stereotypes causing discrimination against individuals or whole groups of people, and helps to raise the level of understanding and acceptance in society. For the vast majority of Readers and Books - reading is a very inspiring and reciprocally enriching process. Human Library works the same way as a normal library; Readers fill a library card, choose a Book from a catalog and borrow it for reading. Then they return the Book back to the Library, and if they want, they take another one. The only difference is that the Book in Human Library is a real person, and reading is a conversation. Books are individuals from the social groups that often experience stereotyping, prejudice, and discrimination and who are willing to share their personal history, experience and knowledge, and respond honestly to the questions of Readers. Human Library is free to Readers. Bring yourself, your friends or family members. Come and listen to the stories of Living Books!